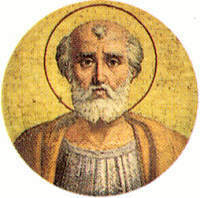 O God, who raised up Pope Saint Callistus the First to serve the Church and attend devoutly to Christ's faithful departed, strengthen us, we pray, by his witness to the faith, so that, rescued from the slavery of corruption, we may merit an incorruptible inheritance. Through our Lord Jesus Christ, your Son, who lives and reigns with you in the unity of the Holy Spirit, one God, for ever and ever. A Christian slave of Rome, Callistus was ordained deacon by Pope St. Zephyrinus, whom he succeeded as pope in the year 217. As deacon he was guardian of the Christian cemetery on the Appian Way which is still known by his name. While he vigorously opposed heresy, his charitable attitude toward repentant sinners incurred the wrath of contemporary rigorists. Callistus was born to a Christian slave who had a Christian master in second-century Rome. He was placed in charge of a Christian bank which went broke. He fled the city, but was caught and sentenced to the treadmill, then later to the tin mines. He was later ransomed and returned to Rome. As a deacon he was hired by Pope Zephyrinus to administer the Church's property and organize the burial of martyrs in the catacombs on the Appian Way, still named the Cemetery of Saint Callistus. Eighteen years later in 217 he succeeded Zephyrinus as pontiff, the sixteenth pope. As pope he regulated the discipline of the sacrament of penance, ruling that penitent sinners were welcome in church. He defended the faith against the Adoptionist and Modalist heresies regarding the Holy Trinity and the Person of Jesus Christ. Under the reign of Alexander Severus, he was thrown into prison, and then was tortured by starvation in prison and scourged daily. Finally Callistus was thrown from a window of the house headlong into a well, where he drowned. Callistus died a martyr in 223. Symbols: Window; model of church; stone; well; millstone or grindstone; papal tiara; a triple cross (papal symbol). Christians have always cared for the dead, particularly because we believe in the resurrection of the body. We should remember to pray for the dead (a spiritual work of mercy), visit cemeteries and pray for the departed souls, particularly those who have no one to pray for them. Take a virtual tour of the Catacombs of St. Callistus. Learn more about the Adoptionist and Modalist heresies. Since St. Callistus worked in the cemetery, recipes like bread of the dead and other recipes for All Souls Day would be appropriate for this feast.